Wallpaper was a thing of the past, but like most trends its back and hot. We like to use wall paper in specific spaces. Your entire home should not be wallpapered. That application is a thing of the past. Use wallpapers in small powder baths, as an accent feature on one wall, on ceiling insets, or other inset applications. Our favorite wallpapers are either bold or a subtle texture. Use grass cloth wallpapers to add texture and use bold pattern and color for small spaces to add drama. Applying wallpaper to your space can add instant style. When you select just the right paper for your space you can transform a plain room into something magnificent. Using wallpaper can bring in scale, pattern, and color in an interesting way. Sometimes texture is needed in a space. Most of our surfaces are flat in our spaces. Using a textured wallpaper on one wall (make sure its the right one!) 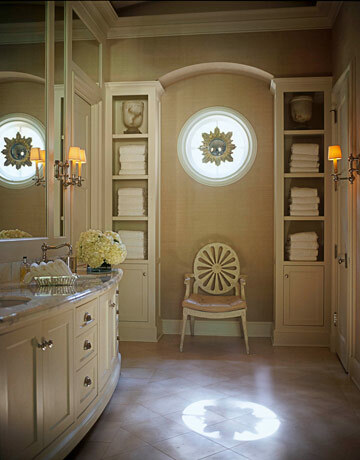 or on the ceiling or inset in architectural details can give the room all it needs. See how much drama is added to this space from the simple wallpaper treatment. One thing to keep in mind is that in a living room type of environment, the wallpaper should coordinate with the color scheme in the main living areas of the home. The black/charcoal color scheme introduced through the wallpaper here should be repeated throughout the main living areas in smaller doses. The inset niche in this dining room is the perfect spot for a wallpaper. You can see how an area that has a natural break makes an ideal place for a bold treatment. Bathrooms are a great area for wallpaper because the wall space is usually limited. Stripes and textures (as shown here) are great for limited wall space. The larger the wall space available the larger pattern you can use. Texture is great for bathrooms because they typically have so many smooth surfaces that need to be balanced with texture. The inset panels in this dining room are a great place for a textured paper. Whenever there is a natural break from architectural details you may want to consider using a wallpaper. Using a wallpaper that is different than the wall color creates contrast that draws additional attention to the architectural features. How often a bedroom is used is an important consideration for selecting wallpaper. 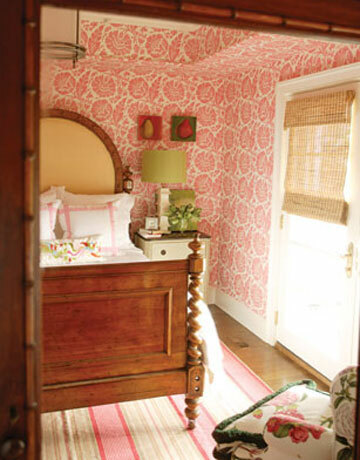 Bold and colorful wallpapers are best used for guest bedrooms. Choose low contrast subtle or textured papers for bedrooms that you use regularly. They are much more conducive to resting. Because dining rooms aren’t used as often as other rooms the are a great place for a statement. 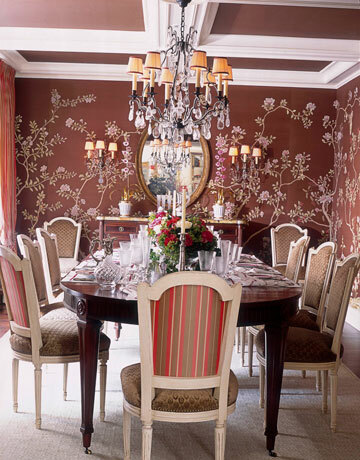 Wallpaper is a great way to treat a dining room. Simplify the window treatments and other color elements in the room if you go bold on the walls. 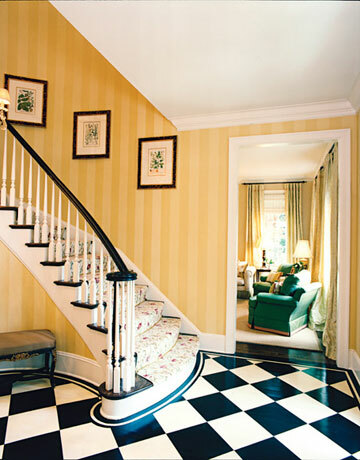 Foyers and entries are perfect for a subtle pop of color and pattern from a wallpaper. Introduce the style of your home right from the entry by selecting a statement piece of wallpaper. Don’t overpower the entry though; keep it simple and carry the theme and colors of the entry throughout the public spaces of the home. Credit to House Beautiful online for some of the great wallpaper pics above.